This past month of daily posting has been fun and rewarding. Thanks to everyone who has read faithfully. I'm not done, yet, but at the end of the week I'll be exhibiting at the Spokane ArtFest and the posts will be less than daily. I will give you my report, though, and stay with me for the next few days, please. I will be posting more fresh works, which will all be exhibited in Spokane June 3-5, 2011. This weekend my family decorated some graves at the pioneer cemetery local to our farmstead. We take special notice of pioneers, war veterans and pioneer infants. One veteran was in the Mexican & the Civil Wars. Several names are recognizable on landmarks around here. The upland view from this country cemetery is spectacular, as it is situated on a massive butte and looks out over rolling farmland. "There are more valid facts and details in works of art than there are in history books," Charlie Chaplin. Some readers know that I have been bottle feeding a litter of kittens whose mother was killed by a coyote. Two different times, I've had the experience of bringing a kitten back from the threshold of death. These limp, comatose pets fit easily in one hand, and I bathed them, forced Pedialyte by soft syringe and just held them. What is it that animates the body just moments before death, and yet vanishes at the point of expiration? 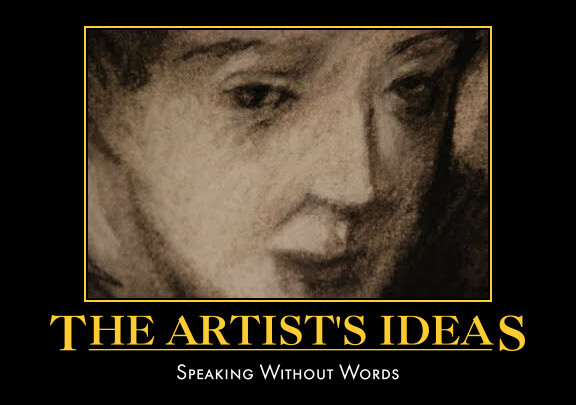 We are considering The Artist's Ideas, a series on the things that are understood in art but not stated outright. Tired of words and heavy thinking? Here is a visual way to understand this subject. 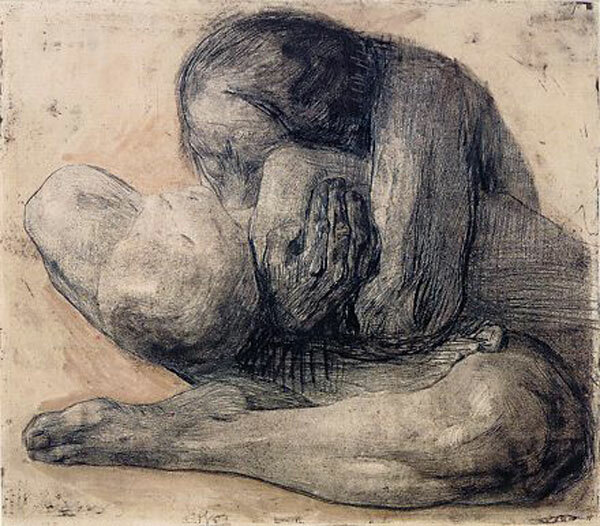 The drawings of German artist Käthe Kollwitz (1867-1945) are easily understood just by looking. I queried her images on Google, and was immediately struck by her poignant meanings. Ugly truths, but tender beauty is revealed by the hand of this master. 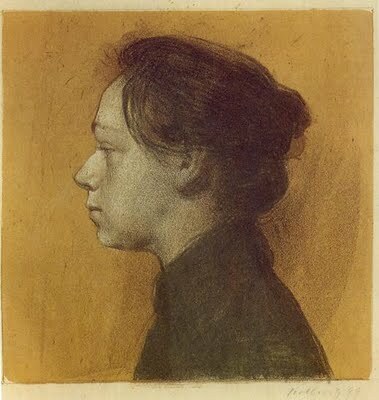 I understand there are about forty schools named after Kollwitz in Germany. This post originally dated October, 2010. We have been framing for the past week. I keep forgetting to sign the art! My wife, and framer, decided that I needed a reminder for this. We're exploring my new works along with songs about the rain. Enjoy. Tom Waits Rain Dogs is anything but dogmatic, but it does bring the rain. There are many more of my new artworks to show you. But, I think I'll spread it out and keep my reader's waiting. Meanwhile, here is the next room in my walking tour of the San Fransisco MOMA. 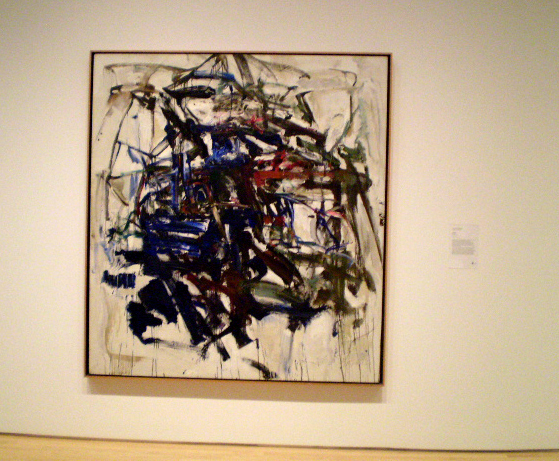 I favored two strong and large paintings in this room, and the first one was by Joan Mitchell. I'll tell you about the other one next time. I had to reach my arms out to either side to gather the dimensions of this painting in my mind. I found it to be just the span of my arms. Then, I imagined it on its side, and again there was just the width of my arms. Gestural. Approachable. Edible. The date interests me a great deal. The height of the the Modernist movement, in my mind, was 1950. 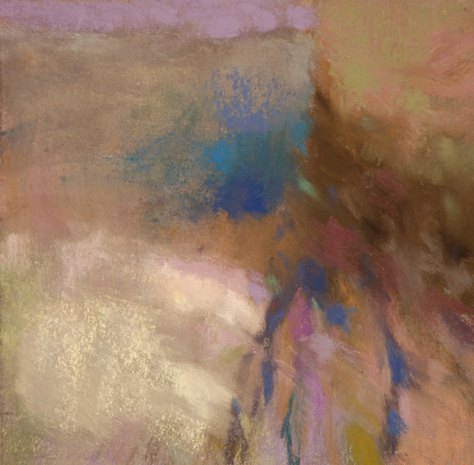 This piece was done in 1960, and the hues are brighter than those used in the fifties. Modern, or Mod? Also, I became more aware than ever of the canvas color, the same as Henri Matisse reveals in Woman With A Hat. Sort of a warm, barely reddish buff or egg-white color. These artists definitely are thinking about the dimension of the canvas itself, and you are immersed by the feeling of painting. Could my kid do this? Of course, I know the answer is "no." But still, the work is far more approachable than Ingres. SFMOMA link to this image. Rainy Day Rivers - No Sunshine For You! The last time I posted about the rainy river, in beautiful Hoquiam, Washington, is here. This painting is the companion piece. Someday, the sun won't shine for you. Or, that's what Jethro Tull said, anyway. You know how it is. It's Raining in this picture. Get it? When a man comes in my studio with an ax, several of my new works get destroyed. It isn't a pretty sight. That man is me, of course. 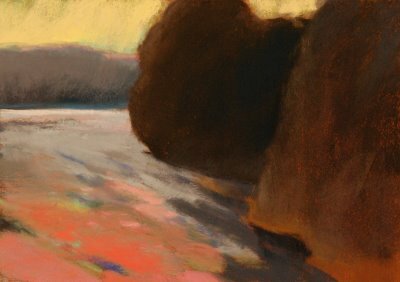 In previous posts, which are listed below, we have been taking a tour of the San Fransisco Museum of Modern Art's permanent collection exhibit. Matisse, The Woman with a Hat. The urinal we all know and love/hate. In these posts, I've brought you some awe inspiring works by the French master, Henri Matisse. 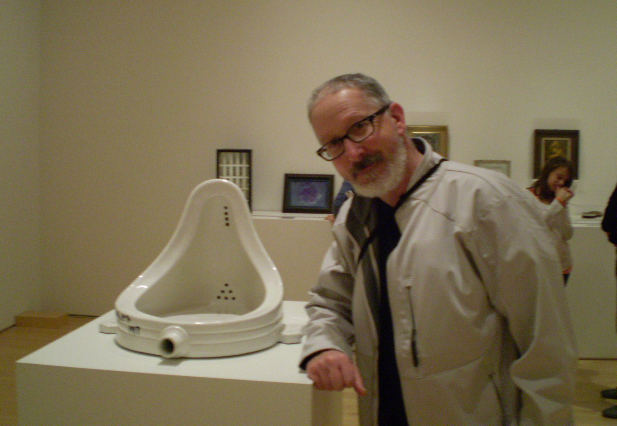 Now, we will confront the most well known object d'art in the world, The Fountain by Marcel Duchamp. From sublime to art crime. In the spirit of Marcel Duchamp, I present the following reactions and ideas in no particular order. Duchamp is a very ostentatious artist. His works and installations are few, but his footprint is large. Say what you will, but Mr. Duchamp's Fountain is a conversation starter. Rather than killing art, it probably renewed dialog on ideas and meaning in art. It isn't a beautiful object, but it does get you thinking. The idea of an ugly object as an installation may be offensive, or it may be a tremendous joke, but I feel that M. Duchamp would be a very fun and interesting guy to sit over a cigar and spirits to shoot the bull with. The Fountain is more complex than you may think at first. Sure, the idea of anti art is easily understood, and the rejection of the aesthetic is not too challenging. But, the story is the thing. 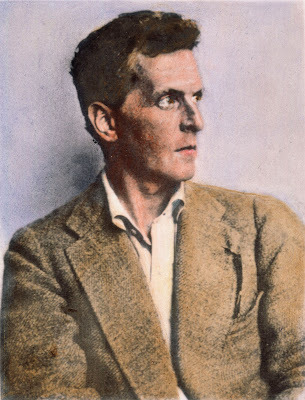 He entered the object in an exhibition where there was no jury, and everything entered was to be exhibited. Except that they rejected his work. That is funny. Then he resigned from the exhibition group, but the rejection brought him lasting fame. The Independent noted in a February 2008 article that with this single work, Duchamp invented conceptual art and "severed forever the traditional link between the artist's labour and the merit of the work". You realize that performance artists vie for the chance to pee on the fountain. Another no-brainer. Dadaist art. Marcel Duchamp is the duke of Dadaism. His name is the foremost among Dadaists, but I also like Francis Picabia. There is always room for the absurd in art, and it helps to have a sense of humor about yourself. Congratulations to Marcel Duchamp for providing us with a laugh, and a conversation. Here is the companion piece to yesterday's painting. The studio is abuzz with activity. My two grade schoolers come out and play on the computer, Lorie organizes and designs the framing for my next shows, and I *supervise*. Yesterday, while we were looking at frames and Lorie was crunching numbers for the frame order, I took apart an old work in the frame, wiped it down, and remade it to my liking. 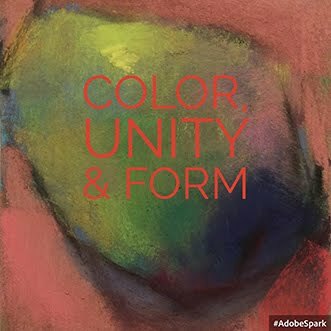 Wolf Kahn talks about painting as a struggle. 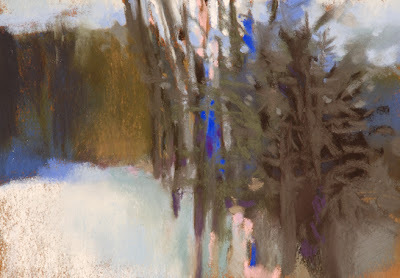 He says, of a painting, that it is complete "when its potential no longer requires articulation." Chew on that tidbit for a while. So, Lorie comes into the room, next, and says, "quit making paintings!" She knows we have to get ready for the shows. You will be seeing some upcountry landscapes here as we get the professional photos taken. This is an exiting time. In eastern Washington, we have buttes, which are hills that promote themselves by standing alone. Thanks to John W. Stinson for finding this video. Red, Yellow, Green, Ultramarine Blue, Blue-Green, Gray & Violet. I must have either skipped Orange, since I have several hand made ones that were done at a Kitty Wallis Workshop, or else I just can't find where I have them. 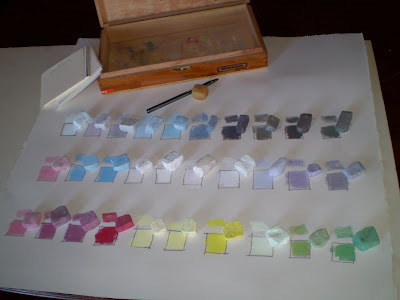 I did make a color chart when I made them, but we had a basement flood and had to quickly put away my pastel making station, so I'm not sure where that is either! This photo will help me decide where to go next in making my next set of sticks. I may have actually made a few more than this, but they are nubs by now and indistinguishable from my Diane Townsends and other store bought ones. 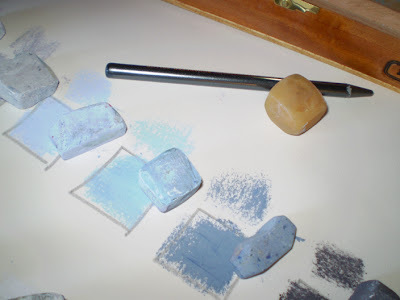 Use this post as a motivator to start exploring the craft of hand making your own pastels. 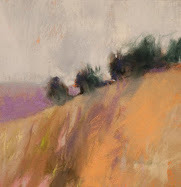 Pigments differ in their qualities, and it can be a hit and miss process, I am told. With the method I use, though, I have been making consistent sticks that I prize. Here is a fun example of some process work. It is a process example two-fer, since the still life genre is a practical exercise, and here you see my color and parameter marks as well. 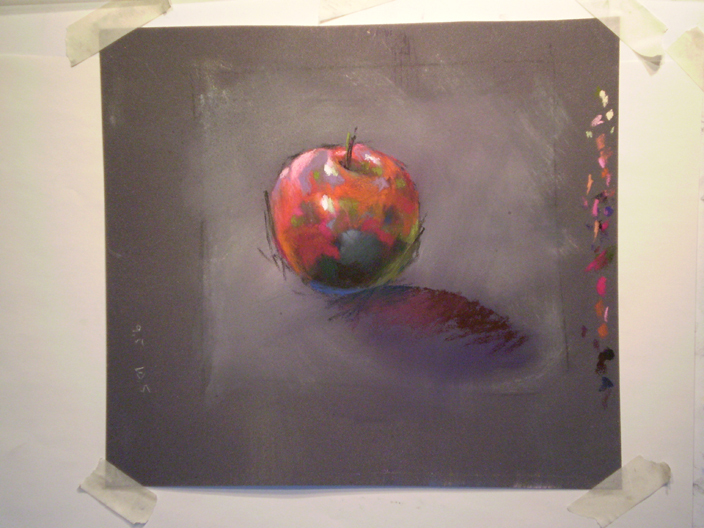 With the exception of some problems with anchoring the apple, I was happy with the outcome of this pastel work. Note: I posted a cool YouTube music video with it, and stumped my panel of commenters with a fun question about it. Unfortunately, those comments and the video don't show. Yesterday's post: Do You Mind? Art & the life of the mind. Longtime readers of The Colorist remember videos posted with river images. Can you guess what this next song has to do with the river? Is Blogger the sixth most popular internet sight? That was a rumor I heard while searching the news about Blogger's over 20 hour hiccup that began yesterday and ran through today. Data corruption was the reason that Blogger reports led to its take down of all posts since Wednesday, May 11th., 2011. At first, access was read-only, and users weren't able to log in to their blogs. As I write this post, Blogger has returned my posts since Wednesday. Who posted corrupt code at Blogger? Inquiring minds want to know. Personally, I did notice some bad behavior by my blog leading up to the outage. Blogger posted my comments, incorrectly, as CaseyBooks, and adding a video on my sidebar that belonged in the posts. The Colorist has been posting daily since May 3rd., and so the impact on my plans has been noticeable. I want the posts to show an uninterrupted daily listing. It is a goal I keep once a year, and the rest of the year I like to post once, twice or three times a week. 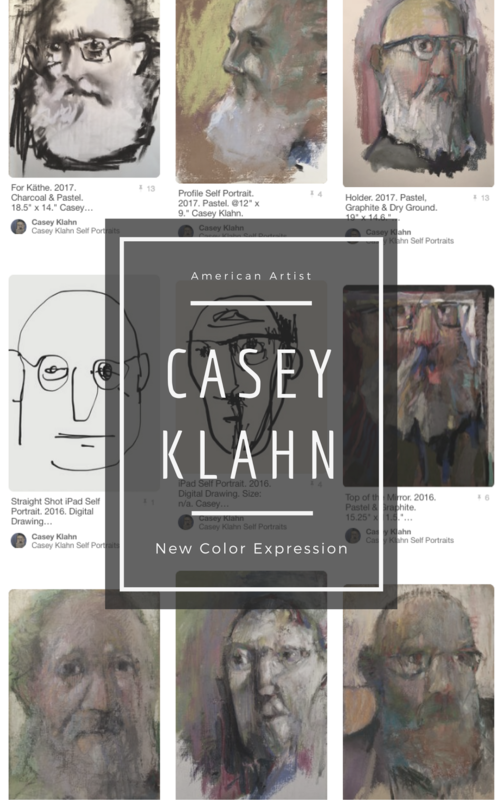 The Colorist is an artist's blog newsletter and forum on fine art, authored by Casey Klahn. Some of the newer readers haven't seen this one, and with apologies to my long time readers, I post this river image just because it has the yellow sky theme. Here is some Studio News. Pour a cup of hot whatever and put up your feet. This is day 9 of my "month of daily posting." Will I make it all the way to thirty days without posting the Ultimate Dog Tease viral video? I'm feeling strong enough to make it, but I may resort to a re-post or two along the way. The studio is so clean, I hope to actually get Lorie out there to take photos of the 69-70 new works that are sitting in flat files. We'll get the pics, but then later on this man, who looks a lot like Jack Nicholson, will visit the studio. He'll carry an ax, and he will cut out maybe half of the works that I, at first, deemed good enough. It won't be pretty. 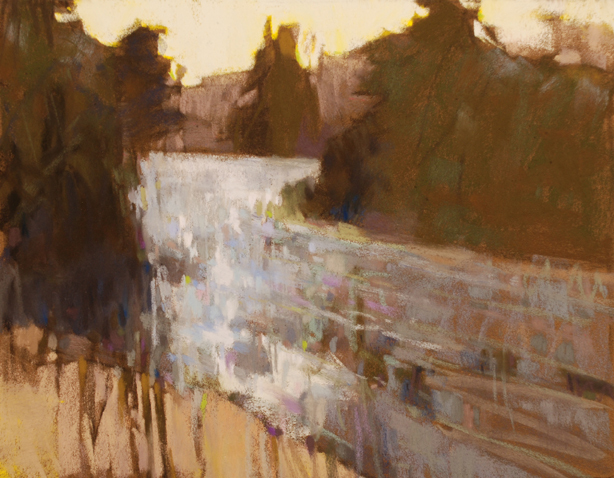 This framing will happen soon, since the first art fair is June 3-5th., in Spokane. It is great to have a close show to work out the bugs on my set-up. If I forget anything, I will be home that night to be able to retrieve it. I haven't done the Spokane ArtFest in 3 years, I think, so that will be interesting to see if anyone remembers me. Loriann recently mentioned re-using frames, and that gave me the push to try to find some first quality black frames to reuse. The way I am making it work is to tape a note on the frame, make the artwork, then also name the work, and tape the name to the target frame. Studio organization is the key. George Orwell said, "There are some ideas so absurd that only an intellectual could believe them." “Common sense is that layer of prejudice laid down prior to the age of sixteen,” Albert Einstein. "It is discouraging to try to penetrate a mind like yours. You ought to get it out and dance on it. That would take some of the rigidity out of it," Mark Twain. "Color is my day-long obsession, joy and torment," Claude Monet. "I decided to start anew, to strip away what I had been taught," Georgia O’Keeffe. "Never be afraid to sit awhile and think," Lorraine Hansberry. 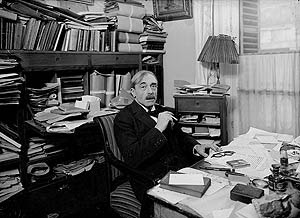 "Sometimes I think and other times I am," Paul Valéry. "You study, you learn, but you guard the original naïveté. It has to be within you, as desire for drink is within the drunkard or love is within the lover," Henri Matisse. "Art has an enemy called ignorance," Ben Johnson. "An artist is a creature driven by demons. He doesn't know why they choose him and he's usually too busy to wonder why," William Faulkner. 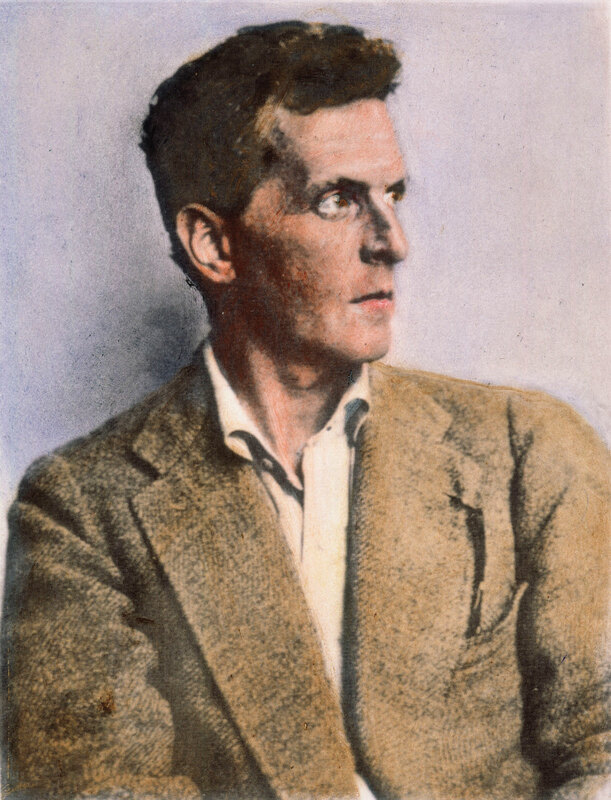 "Imagine someone pointing to the place in the iris of a Rembrandt eye and saying: 'The walls in my room should be painted this color,' " Ludwig Wittgenstein. You may have noticed the frequency of posts here at The Colorist lately. Since May 3rd. I have posted daily, and the goal is to post daily for thirty days. Now would be a great time for you to subscribe via RSS, Blogger Follow Me, Google Reader, Facebook, Bloglines or whatever you favor. See you tomorrow! 360 of the studio kitchen, May 8th., 2011. 360 of the studio - May 8th., 2011. A clear day, looking north. This is news. Yesterday I had visitors to the studio, and so this morning was a perfect opportunity to get some panoramic images with a handy app. I downloaded. These aren't perfect, but they are way faster and easier than using Photoshop! One thing I got out of a fun studio visit was that I should begin that lesson plan I've been procrastinating on: How to Art Blog. 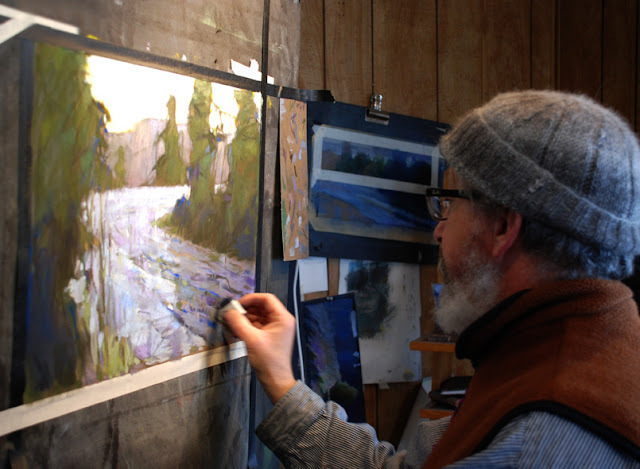 I have a classroom in the Seattle area to present it, but it is hard to nail myself to the desk when the easel beckons. If I start now, I can make the How To into a series for the blog, and then I'll have my lesson plan. Two birds; one stone. My studio is at our farmstead in eastern Washington, near Davenport. Simple, big and humble would be a good description of my space. Easy to work in and well organized for the task of making pastel landscapes. When I say "art is long," I mean even some prehistoric art survives till now and blows us away. The caves of Chauvet, France as a for instance. Surprisingly, I enjoy these drawings more than some of the other cave drawings. Prehistoric Avant-Garde, maybe. "...my idea of what a house should be is dead." Sippican Cottage. This guy writes essays like you burn toast. Often, and well. When I'm searching for painting ideas, the simple, direct approach is best for me. 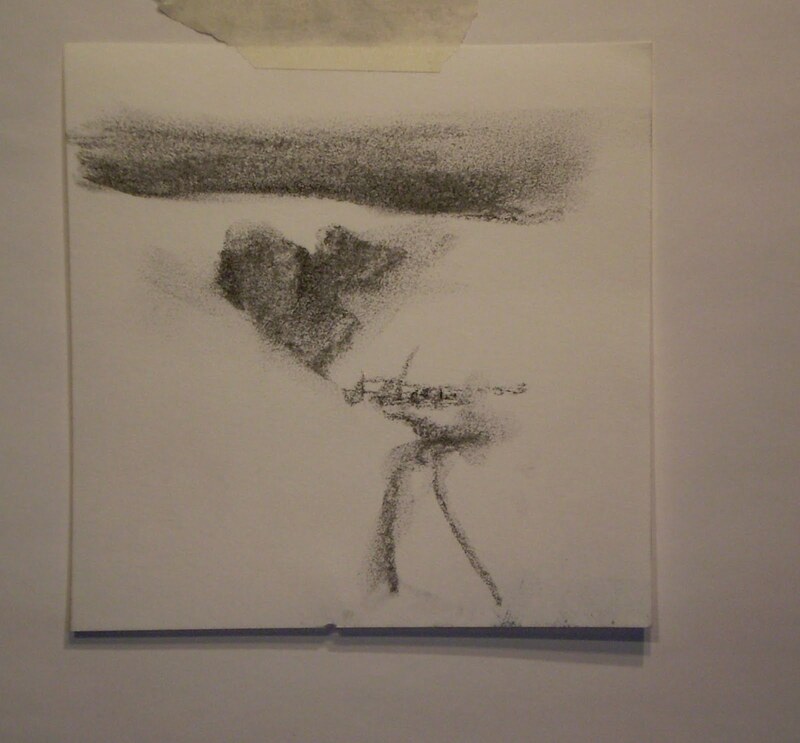 Drawings about 6" x 6". The studio has had my close attention for the past several weeks. Time to remove a few layers of dust, and go back at it. 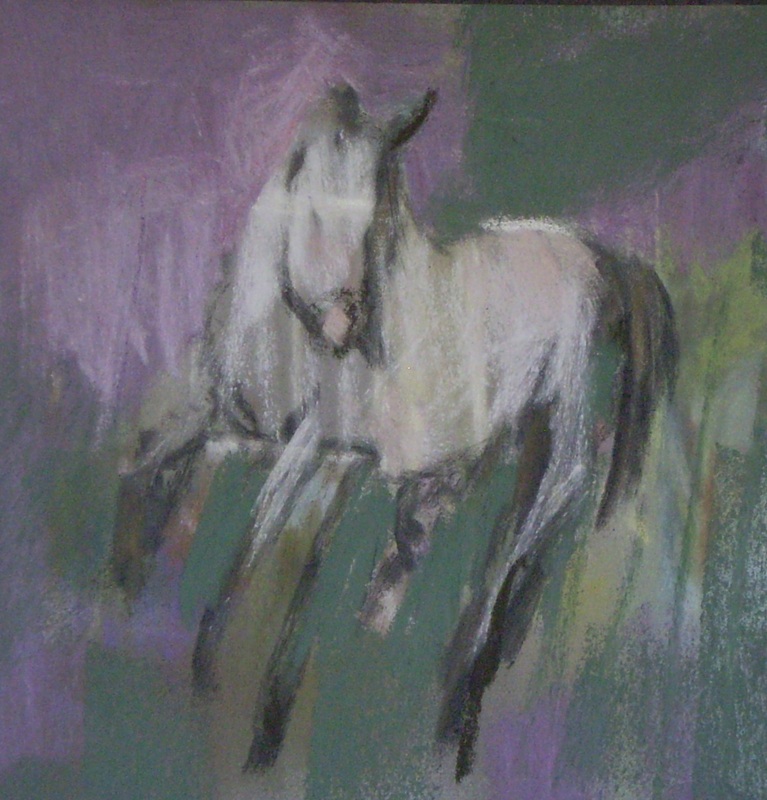 This year, my pastels are a little bigger, and my output is up. One thing that has helped my "go big" has been to not be too enamored with an image being a "full sheet." 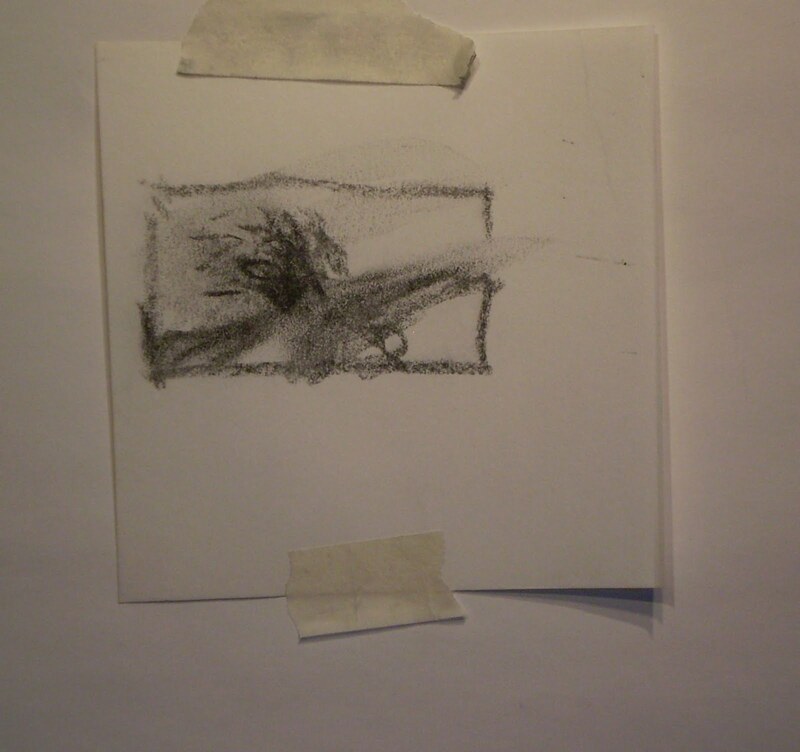 Full sheet means a standard size sheet of artist's paper, and many people relate that to sheets of watercolor paper. About 19" x 25" or sometimes a bit bigger. 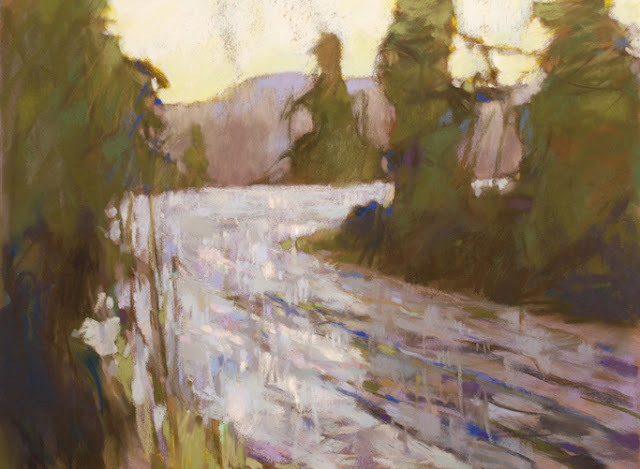 Subjects for me this year are the Hoquiam River, fields and prairies in my region of eastern Washington, and I am returning to the deep forest images that I used to do a number of years ago, only with an updated vision. Please enjoy these studio snapshots taken with my new iPhone (more on how that effects the studio life later).